Blessed is He who made constellations in the skies and placed therein a lamp and a moon giving light; and it is He who made the night and day to follow each other: For such as have the will to celebrate His praises or to show their gratitude. Wahawi, ya wahawi iyyahah You have gone, O Sha'ban, You have come, O Ramadan, iyyahah The daughter of the Sultan is wearing her caftan, iyyahah For God the forgiver Give us this season's gift. Some believe that the children's lantern song comes all the way from Pharaonic times, like the ancient Egyptian song called O-Faleh in the Pharaonic tongue and al-Bahr Sa'id in Arabic (meaning "The River Has Risen"). In the days before the Aswan Dam was built, that song was sung by groups out in small boats on the night the Nile reached the peak of its annual flood. Certainly, the lantern song is very old, and very Egyptian. The opening lines - "Wahawi ya, wahawi iyyahah" - have no known meaning. "You have gone, O Sha'ban" refers to the month that comes before Ramadan in the Muslims' lunar hijri calendar, and "the daughter of the Sultan is wearing her caftan" means she is dressed in the garment worn when going out, maybe to the mosque. "Give us this season's gift" refers to the small presents children receive from family and friends at the time of the 'Id or holiday that follows the month of fasting. In the days leading up to Ramadan, children become more insistent about having a lantern; many can hardly wait to start swinging and singing - for what child, from its earliest years, is not attracted by a glowing, magical lantern? Yet Cairo children may be the most "lantern-struck" of all: Recent research by Dr. Marsin Mahdi of Harvard University indicates that Scheherezade's 'Alaa' al-Din (Aladdin) of the magic lamp may well have been a Cairo boy. One week before Ramadan begins, part of Ahmad Maher Street, for most of the year a humble thoroughfare in the old medieval quarter of Cairo, is transformed. Usually home to tinsmiths, marble-cutters and makers of mousetraps, for one glorious month it becomes "The Street of the Lanterns." To get there, you turn off Port Said Street in front of the Museum of Islamic Art, into Ahmad Maher Street, pass the central police headquarters and walk for 10 minutes or so toward the great 11th-century city gate, Bab Zuwaylah - a stone's throw from the famous Tentmaker's Bazaar (See Aramco World, November-December 1986). Just outside the massive medieval gate, you will find the facades of dozens of small shops festooned with thousands upon thousands of Ramadan lanterns, small, medium and big ones, suspended from crossbars or strung up on poles, waiting to delight the hearts of young Muslim Cairenes. The lantern-makers themselves are very humble people, often working in small rooms, in corners, in alcoves or simply under corrugated iron shelters. 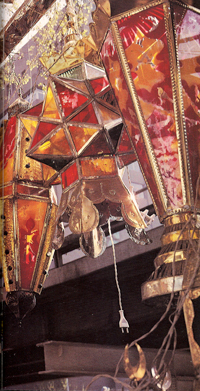 The work of producing the tens of thousands of lanterns required to meet demand during the season usually begins about nine months before Ramadan. Sometimes entire families spend their lives, from generation to generation, working in the various aspects of the lantern business - like Said Hanefy Diab, Salama Hanefy Diab and Sayed Hanefy Diab, shown on these pages. 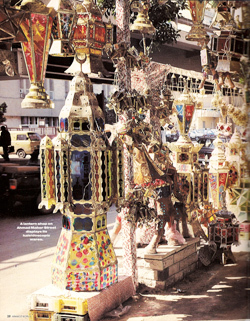 Mahmoud el Said, now 25 years old, has been making lanterns since he was 10. In his small dark room within the shadow of Bab Zuwaylah, he sits cross-legged day after day in front of a constantly burning blue flame with Wagih, his 15-year old assistant, at his side. All day long Mahmoud wields his soldering iron like a medieval magician's wand, back and forth, deftly creating lantern after lantern. Each fragile lantern-frame is made from thin strips of tin usually cut from old tin cans. Pieces of hand-colored glass are then inserted into the frame and finally, when a lighted candle is placed inside, the lantern glows with translucent beauty - at least for the few weeks of Ramadan, for they are not meant to last longer. Each day, in every shop and workshop, dozens of lamps of different designs are made and then carefully stored away in wooden crates, or strung from floor to ceiling, in readiness for the season. Most of them are no more than about 25 centimeters (10 inches) high, but others can be enormous constructions as much as 150 centimeters tall (almost five feet), like Mahmoud's "Bride of the Nile," destined to shine in a five-star hotel. Only the lantern-makers know all the designs, manufacturing secrets and, above all, the names of their magical lanterns. New designs are sometimes created to commemorate special events: A special lantern named "Farouk," after the late Egyptian king, was created many years ago when he was a boy. One of Mahmoud's smallest is called Musa, or "Moses"; a much bigger one is Shaqqat Battikhah Kabirah ("A Big Piece of Watermelon"), bigger still is Najmat al-Bahr ("The Star of the Sea"), which waits in his shop to glow in the night and gladden the heart of some child, once the holy month arrives. These odd and endearing names you will never know unless you ask; they are a part of childhood fantasy, echoes of the magical lanterns in the children's own stories, like the tale about the old man who polished his lantern until the good 'Afrakush appeared. 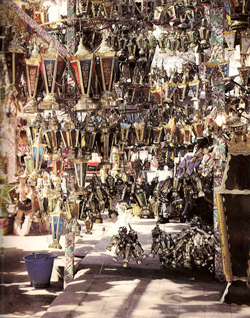 Until the end of the last century, there were very practical uses for lamps and lanterns in Cairo, often prescribed by laws going back, some say, to the very first Pharaonic towns, or niwits. A niwit was usually created by laying out a single main street running due north and south and then a single cross-street, from east to west, all set within a circle of protecting walls. Al-Qahira (Cairo) itself, the original private palace-city of the founding Fatimid rulers of Egypt, was laid out in this way: a single street surrounded by a ring of protecting walls. To this day, the old north-south main street still exists, twisting and turning through the medieval city, just as it has for a thousand years. The Qasabah, the city center or Main Street, of al-Qahira came to be known as al-Tariq al-Sultani, or the Sultan's Way. The street led, as it still does, from the main entrance gates on the northern side, right across the city to the opposite southern entrance of Bab Zuwaylah - where most of the lantern-makers are found. Al-Tariq al-Sultani later became known as al-Shari' al-Sultani, and remained the main street of the city. Over the centuries, individual houses and harahs, or multi-family compounds of homes, were built in the area. These settlements were joined to al-Shari' al-Sultani by small side streets, each with its own protecting gate, and some of these ancient stone-arched gateways still exist on the Qasabah. Security along the Main Street was the responsibility of the wali, or governor, of the city and his shurtah (police). There were actually three walis: one for Misr, the Arabic name for Egypt, which was probably used to refer to the old parts of the city built before Fatimid Cairo; one for al-Qahira, the Fatimid palace-city; and a special wali for the all-important Citadel, the city within the city, founded by Saladin in 1176, that overlooks Cairo. The famous ninth-century mosque of Ibn Tulun, built in the open desert in the days before "Cairo" was ever thought of, became the dividing line between Misr and al-Qahira, and indeed, between Upper and Lower Egypt: Everything south of Ibn Tulun became known as Upper Egypt and everything north of it became Lower Egypt. Each harah settlement came under a shaykh al-harah, a kind of mayor responsible not only for security and religious matters but also for closing the harah gate at sunset, opening it again at dawn and lighting the lantern which, by law, was required to hang over each harah gate. Likewise, each big house in the harah was required to burn a lantern at night above its entrance and each harah resident had to carry afanus, a folding lantern something like a small concertina, while out walking at night. God is the light of the heavens and the earth. The parable of His light is as if there were a niche and within it a lamp: The lamp enclosed in glass: The glass as it were a brilliant star: Lit from a blessed tree, an olive neither of the East nor of the West, whose oil is well-nigh luminous, though fire scarce touched it: Light upon light! God doth guide who He will to His light: God doth set parables for men: And God doth know all things. Also unknown to most Europeans was the fact that the lanterns, hoisted to the tops of the minarets at sunset, signalled to Muslim Cairenes that the last rays of the sun had just disappeared below the horizon, thus releasing them from their daylight fast and allowing them to participate in the fast-breaking meal. 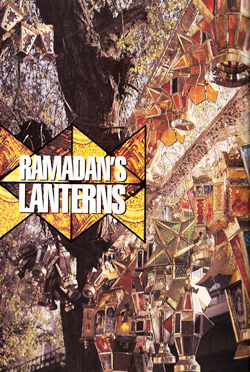 The Ramadan lanterns continued to burn in the night sky, carefully calculated to last until "the raf of the lanterns." The word raf, in Arabic, means removal or lifting, and "the removal of the lanterns," after sahur, the last meal before daybreak, signaledimsak, or the end of the night's feasting and the resumption of the Ramadan fast. In the course of a thousand years, some things in Cairo have not changed. Though the glowing mosque lanterns of Ramadan have been replaced by greenish fluorescent tubes which are no longer raised and lowered, the old term raf still persists - though if you ask why, or what it means, hardly anyone knows. Filmmaker John Feeney, who has lived in Cairo for a quarter century, is a long-time contributor to Aramco World. He wishes to thank Laila Ibrahim, renowned authority on Mamluk Egypt, for her help with this article.